"Crespire LCD writing tablet is useful writing tool for student, teacher, designer, business man, doctor, and housewife as daily note.It is really a good gift for adult or kids as well as the baby enjoying the doodle. 1)Do you always have many things to do, but sometimes you always forget to do something? You need the to do list as a time management tool, but it's not convinient for you to check the list on the PC or mobilephone all the time.If you write on the paper,maybe you can't find the paper. 2) Do your kids always want to draw something, they would use the pen to doodle on your notebook or the wall and everywhere, and make everywhere dirty as well as themselves? You deserve the CRESPIRE LCD writing tablet! ①CRESPIRE LCD drawing board is an electrical handwriting board with a Button cell in it.No need ink or chalk. ②10 inches board 192g lightweight and an ultra 0.25"" thin,wherever you go,You can easily to hold and store in your scheduler, briefcase or backpack. ③The roundness edge design give you the comfortable experience.Smooth one button erase design will offer you a happy feeling. ④ And the lock function can prevent you from erase by mistake. ⑤ The kids can doodle as they want on the electrical tablet indepentedly, no need to be worried about the ink or the chalk dust dirty the cloth or the wall, no need to worried about the dust harmness to the kids. And it's so simple for them to erase the screen, even the baby can do it. " Portable & Easy to use: Crespire electronic writing board is 192g lightweight and an ultra 0.25" thin. Wherever you go,You can easily to hold and store in your scheduler, briefcase or backpack. APPLICATION:Crespire is useful writing tool for student, teacher, designer, business man, doctor, even for housewife as daily shopping note.It is really a birthday gift Christmas gift for children,friends. ADVANTAGE: Eco-friendly Environmental protection, paperless, lightweight,It is quiet easy for you to take with in a purse, scheduler, briefcase or backpack. 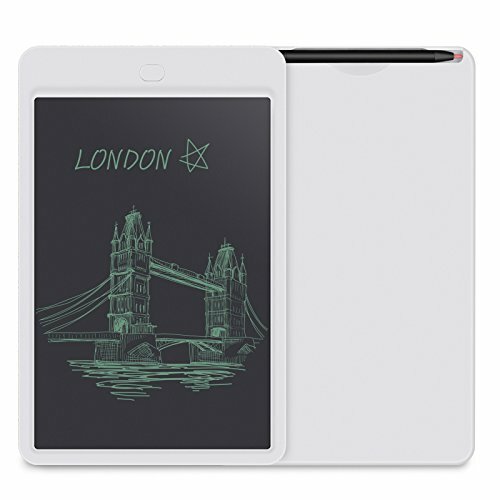 SPECIFICATION: Ultra 1/8 thin" ,different size LCD writing tablet.Dimensions including 8.5inch,10 inch,12 inch .Sealed watch battery provides over 50,000 erase cycles.and it can be replaced, economic savings. If you have any questions about this product by CRESPIRE, contact us by completing and submitting the form below. If you are looking for a specif part number, please include it with your message.